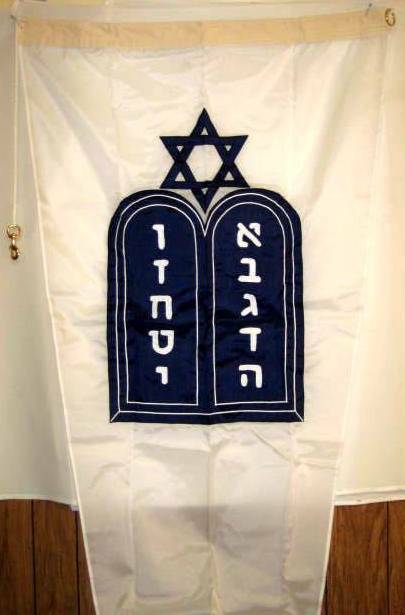 The Jewish worship pennant was approved by the Secretary of the Navy in December 1975 as the equivalent of the traditional church pennant used for Christian services. It is flown above the ensign at the ensign staff (not underway) or gaff (underway) while Jewish services are being conducted aboard a warship by a naval chaplain. The pennant is white with a rounded tip and the emblem of the Jewish chaplaincy--the tablets of Moses surmounted by the Magen David all outlined in dark blue--set with the top toward the hoist.